Why Arsenic and its Compounds Can poison Quickly, (Acutely), as Well as Over a Long Term, (Chronically), and Why They are Used Often by Poisoners and Terrorists? The TOTAL AMOUNT of Arsenic incorporated into the body. (“DOSE”). The RATE Arsenic is incorporated into the body. The PARTICULAR ARSENIC COMPOUND incorporated. The VENUE of incorporation, i.e. ingestion with food or drinks, breathing or skin contact. The RATE OF DISCHARGE of arsenic via the urine or excretions. The MEDICAL CONDITION of the person exposed. Arsenic can penetrate into the body through the skin or the lungs but Arsenic mainly enters via drinking water or food that has been eaten. Most Arsenic compounds are soluble in water to some extent and thus are easily transported in the blood stream and assimilated by the body. The water solubility also helps remove some of the Arsenic via the urine and the excrement. Unfortunately, a significant portion of the ingested Arsenic is absorbed by various bodily tissues and is retained for an extended period. SMALL amounts of Arsenic are REQUIRED for normal operation of the body. However, larger doses can be fatal. An ACUTE FATAL DOSE of Arsenic is in the range of 2-20mg/kg body weight/day. Thus, a relatively healthy person who weight 160lbs, about 72.6kg, may die if he ingests between 0.145gm and 1.45gm Arsenic in the form of Arsenic Trioxide, As2O3. i.e. 0.192gm to 1.92gm of Arsenic Trioxide. (Arsenic Trioxide is probably the most commonly available Arsenic compound). Considering the high density of the oxide, less than 1/8 of a tea spoon can be fatal. Smaller amounts may be fatal if unhealthy people, elderly or children are exposed. The symptoms of poisoning by SMALL amounts of Arsenic are not always distinguishable from symptoms of other afflictions. Thus, although one may think that he is being poisoned by Arsenic, only exact analysis can reveal if the symptoms are due to Arsenic poisoning or due to other maladies. Some of the Arsenic that enters the body is excreted out of the body rather rapidly but a fraction of it accumulates in various organs, including even the hair and the nails. The fraction of Arsenic that is retained in the body depends on the specific Arsenic compound that entered, the venue that it entered through, i.e. ingestion or inhalation, the food eaten with the Arsenic compound, etc. The Arsenic that is retained in the body will continue to be eliminated but at a slower rate. However, as long as the Arsenic is in the body, it will continue to cause physiological damage. Exposure to small doses of Arsenic compounds over a long period of time can result in lung, skin or liver cancer, or cancer of the lymphatic system. Damage to organs, such as the esophagus, can cause speaking difficulties. Exposure to small doses of Arsenic may also cause confusion and disorientation. Symptoms of exposure to small amounts of Arsenic vary and may include fatigue and sleeplessness increased production of saliva and sweat and hallucinations. As the exposure increases, one may start having problems with his stomach and urinary track. This may include difficulties in urination associated with pain as well as nausea and vomiting, pain in the abdomen, mainly in the bowel area including lose bowel movement and intestinal disorders. Liver breakdown always happens as a consequence of chronic arsenic poisoning. Bad odor from the stomach is accompanied by green or yellow vomit, sometimes with blood, occurs as the Arsenic exposure increases. Every person is exposed daily to Arsenic because most drinking waters and foods contain trace amounts of arsenic. The body can tolerate small doses of Arsenic without noticeable physiological effects because Arsenic is excreted from the body. Small amounts of Arsenic are needed for the body to function properly, but large amounts are invariably toxic, regardless of the specific Arsenic compound. Arsenic atoms may be present in compounds in the trivalent or the pentavalent form. In other words, it may be connected to other atoms using three bonds or five bonds. The trivalent Arsenic compounds, Arsenites, are much more toxic than the pentavalent compounds, arsenates. Arsenic may be connected to carbon atoms, in which case the compound is called ORGANIC or may be connected to other types of atoms, when it will be called INORGANIC. Inorganic arsenic compounds are in general much more toxic than organic compounds. Many Arsenic compounds will impart a garlic-like smell to a food or to the breath of the person who consumes them. Since the chemical properties of Arsenic are very similar to the properties of phosphorous, and because phosphorous compounds are critical in numerous biochemical functions in the body, Arsenic is toxic in all functions where biochemical reactions that involve phosphorous are involved. Most drinking water contains small amounts of Arsenic. The Arsenic concentration in treated municipal water in the USA is supposed to be smaller than 10 parts per billion, ppb. Natural water leaches small amounts of Arsenic from rocks and sand. Some industrial operations sometimes contaminate water with Arsenic. Arsenic was found in items such as wine, juice, syrup, glues and pigments. Arsenic is found in many foods both as organic compounds such as methyl arsines, and as inorganic arsenates and arsinates. The organic compounds are less toxic than the inorganic compounds. Inorganic arsenic compounds were found in apple juice, orange and grapefruit juice, in vinegars and salad dressings, in milk and dairy products, beef, pork, poultry and in cereal. Arsenic is found in most unshelled rice but also in shelled rice and in its products. Sources of Exposure to Arsenic During Occupation. Production of semi-conductors, notably of fast chips based on gallium arsenide. The process often involves the toxic gas ARSINE, AsH3. Manufacturing of drugs which contain Arsenic. (Including some anti-cancer drugs). Manufacturing and use of pesticides and insecticides which contain Arsenic. Treated wood to give the wood stronger resistance to the elements. Although in most countries the use of Arsenic and its compounds for Applications 5, 6, 7 and 8 has been banned or discontinued, there are still many products that contain Arsenic which were manufactured before the ban took effect. This includes treated wood in children playgrounds and old containers of rat poison. All Arsenic compounds are HIGHLY TOXIC. (The LD50 of Arsenic Trioxide is 16 mg/Kg). Arsenic is very reactive and can interact in many forms. Arsenic can react in acidic media, in basic media and even form fat-soluble organic compounds. 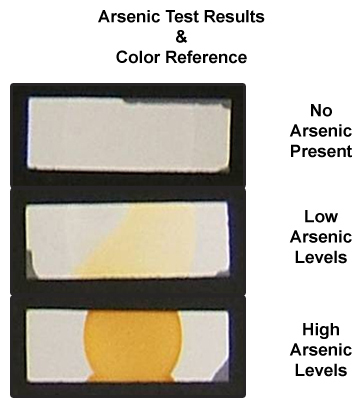 Arsenic salts have NO COLOR attributable to the Arsenic. Arsenic salts toxicity shows up very RAPIDLY. Arsenic DOES NOT CHANGE A FOOD’S TEXTURE. Arsenic salts SIMULTANEOUSLY DAMAGE SEVERAL body functions. Arsenic and its salts may impart to the food the SMELL of garlic. Arsenic Trioxide, As2O3, is the most frequently found Arsenic compound. 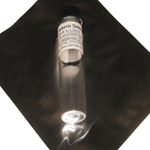 Arsenic Trioxide is very toxic, the LD50 is 14.6 mg/Kg, (Rats). Exposure to small doses of Arsenic Trioxide over a long time can cause cancer, although small amounts are REQUIRED by the body for proper functioning. In addition, some medicines, used to cure certain cancers, including leukemia, contain formulations which include Arsenic trioxide. Arsenic trioxide is present in the water we drink, and to some extent, in every food and drink we consume. Arsenic trioxide has a complex chemistry which helps it transform to other Arsenic compounds based on its environment, and thus Arsenic can be very persistent once it’s absorbed into the body. In an alkaline environment, it forms extremely toxic arsinates, AsO2-1 ions. In very acidic media, it forms compounds such as Arsenic trichloride, AsCl3 In oxidizing media Arsenic is transforms and forms ionic Arsenate compounds, AsO4-3. In reducing media it forms the extremely toxic Arsine gas, AsH3 and depending on the environment, organic arsenic compounds such methyl-arsenic compounds, which are less toxic than the inorganic compounds. Arsine, AsH3, is a gas used in many applications but mainly in the production of semi-conductors and fast computer chips based on gallium arsenide. Acute short exposure to 250 ppm, of the arsine gas can rapidly result in death. Arsine is absorbed by inhalation, where in the lungs it rapidly reacts with hemoglobin which results in its destruction. Very few options can be used to save a person life, but rapid removal to a place with clean air should always be the first step. Concentrations as low as 0.5 ppm Arsenic may trigger the initial symptoms of exposure. These symptoms of exposure to small-to-moderate exposure to arsine may appear immediately or only after several hours include headaches, vertigo and nausea. Subsequently, problems related to oxygen transfer in the body due to interferences with the hemoglobin, as well as problems with the functions of the kidneys and urination may occur. The color of the urine and excrements may change to darker red-brown or even greenish color. Arsenic has been used widely in the United States as a wood preservative. Wood is usually pressure treated with Chrome-Copper Arsenate. However, being applied to wood does not permanently sequester the rotting of the wood. In addition, arsenic continues to leach into the environment from the treated wood. This is a major source of Arsenic in the environment, in particular in children play grounds where arsenic-treated-wood was used to construct various structures. Eventually, as the wood comes into contact with both soil and water, the arsenic is released to the environment. Some forms of anaerobic bacteria methylate the arsenic, making it water soluble or extremely volatile. Therefore, there is currently a rising level of arsenic in the environment that is biologically available and accessible. Bacteria within soils and sediments can transform arsenate to arsenite, which can be converted into methylarsenic acid. Also within the soils and sediments, bacteria can transform methylarsenic acid into dimethylarsinic acid. All these arsenic compounds then become available due to rain and drinking water. Molds can convert methylarsenic acid into trimethylarsine, which can then also be available within water. In addition, molds and bacteria can convert dimethylarsinic acid into both trimethylarsine and dimethylarsine in water. Once in water, trimethylarsine and dimethylarsine can volatilize into the atmosphere. Therefore, different forms of arsenic can be found in the soil, sediments, water, atmosphere and the food chain. The probability of successful removal of arsenic from the body and minimizing its harmful effects is greatly increased if the intervention is done as short a time as possible after the exposure. The reason is that arsenic compounds begin destroying the blood cells immediately after absorbed in the blood and begin reacting in the kidneys and urinary track shortly thereafter. Removal of a person from the exposure area when it comes to arsine gas and controlling the food intake in the case of ingestion. Hemodialysis to remove Arsenic from the bloodstream before it binds into tissues. Blood transfusion, if done shortly after the exposure. Bowel irrigation to remove arsenic which was not assimilated yet in the body. Some success was observed by using chelating agents which react with the Arsenic and accelerate its removal from the body. The most important chelating agents are Dimercaprol, (Also known as BAL), Succimer, (DMSA), and Dimerval, (DMPS). All the chelation agents are toxic and should be used only under qualified medical supervision. 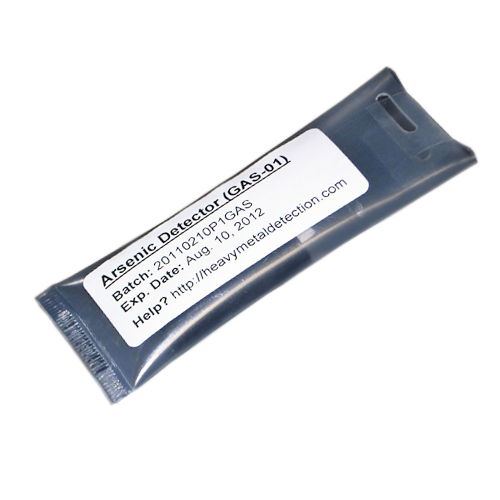 Both the AJ-05 and the AJ-LOW-01 Arsenic Detectors have their samples prepared using the same method. 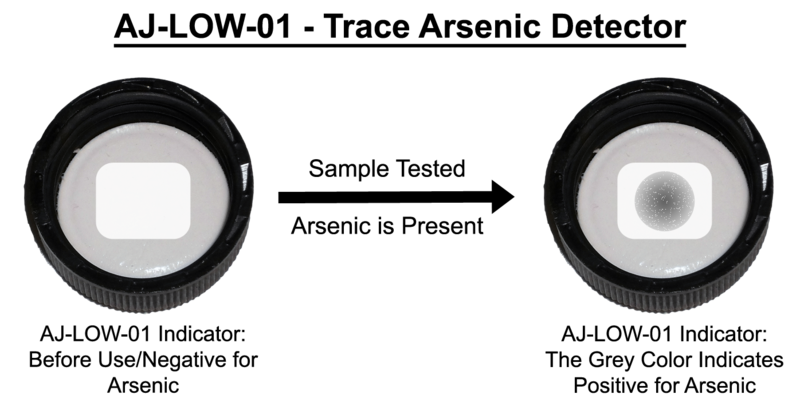 The detectors were designed to predominantly test Arsenic in liquid samples such as; Water, Apple Juice, Orange Juice, Syrups, Milk and similar liquids, but they can be used to test for Arsenic also in solid foods and pasts. To test viscous samples of liquids such as Syrups, the sample first has to be diluted by an equal volume of very clean water, preferably distilled water, and then tested. To test samples of solid foods or pastes, the solid food has to be minced and then mixed very well with an equal volume of very clean water. When testing, use only the water portion of the sample. Pasts such as meshed potatoes also have to be mixed with water very well before testing.